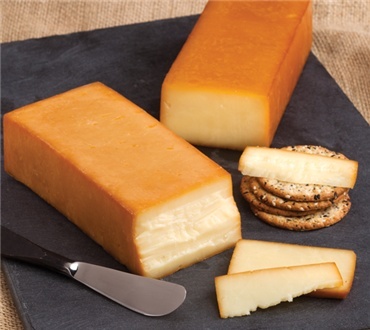 Bathed in a cool smoke from smoldering corn cobs for six hours our smoked cheddar takes on a golden bronze color and its own uniquely delicious, bold flavor. THe mouth-watering taste of this cheese is perfect in omelets, melted on nachos, or served with cocktails; and believe us, nothing better could happen to your next hamburger. I don't usually like smoked cheese but I go out of my way to order this. The smoke actually adds something to the flavor of the cheese instead of overwhelming it or making it yucky. Please keep making this! Perfect with DF pepperoni or maple kabanos. Simply the best you will find! We love to snack on this cheese primarily. I have used in on grilled sandwiches, grated in salads, grated in scrambled eggs, and in cheese sauces. I also give it as a gift. It is by far the best smoked cheese on the market!